Scandinavia bristles with vibrant scenery amidst its cold, dark winters. 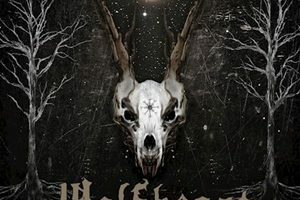 A perfect backdrop for musicians to unleash their feelings through instruments in a constructive manner – with Wolfheart being one of those prime movers for the extreme, melodic death/black scene in the metal realm. Constellation of the Black Light as their fourth album – and first for new label Napalm Records – keeps the vision and execution at full alert. Coloring the music as they see fit with acoustic supplementation, the quieter/introspective elements are just as important as the furious electric segments of blackened trills, savage screams/growls, and intense blast beats. 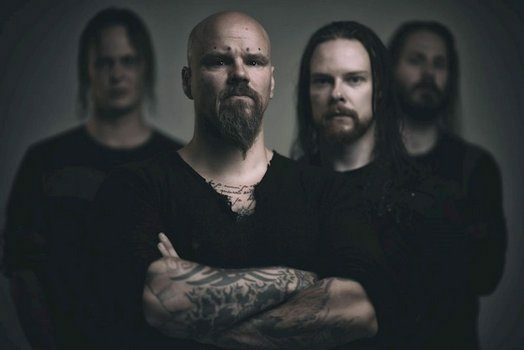 In preparation for their first North American tour in their career, guitarist/vocalist Tuomas Saukkonen gave us some time to discuss the latest happenings for Wolfheart. In this latest talk we handle everything from drummer Joonas Kauppinen’s health issues since having back surgery, the challenges regarding their latest album, the negotiations of a new record deal, and expectations for the new tour runs the band will be engaged in. Dead Rhetoric: How has drummer Joonas Kauppinen’s health been since having back surgery earlier in the year? Tuomas Saukkonen: A lot better. It was quite tricky with the back thing. Something in between the vertebrae, the cartilage popped out, but not in a regular direction – it went sideways so it was pressing quite badly on the nerves and was affecting the ability to use his left leg. That is a bad situation for a drummer, and not being able to sit down and use one of your legs. It was a little bit stressful, not only because he is one of my best friends but he’s my drummer. Luckily he got the surgery very fast and there was no permanent damage to the nerves. Now he’s actually better than ever. Dead Rhetoric: At what point did he notice he was having issues with his back – is it something that he noticed over time? Saukkonen: It had been going on for quite a long time. He had been complaining, and he went to see a lot of physiotherapists, of course they didn’t realize it was so bad, they thought it was some sort of muscle issue. It was in the studio that he realized it was affecting his playing – the brain was sending the messages but the legs weren’t working. He managed to do all the drum takes in a way he could manage, but it took way more time. During the studio time he booked the doctor who would be doing the surgery, it started to take more of an effect on the leg and the pain wasn’t as much in the back anymore. 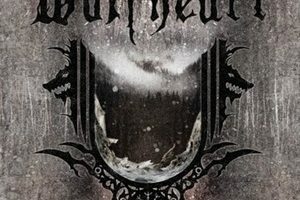 Dead Rhetoric: Constellation of the Black Light is the fourth Wolfheart album. At this point in the band’s career, are you happy with where you are positioning yourselves or do you think you could be further up the ladder in terms of popularity/success? Saukkonen: I’m really happy – if you count all the albums, this is the third album that is officially released by a record label. Because the first album Winterborn was released by ourselves through my own label- and there is no distribution outside of Finland, basically no promo budget. Since the Shadow World album things have been going quite quickly. Especially now, I believe and hope that we are going to take a bigger leap than what we have done with the previous albums. We have changed the label, we have changed management, we have a new booking agency, the first time we will ever get to tour the US- this is quite a big deal for a European band. I think things are starting to move even faster forward. Especially considering the situation with the music business at the moment. Dead Rhetoric: Outside of Joonas’ health issues, were there any other obstacles or challenges you faced with the new record? Saukkonen: A ridiculous amount of obstacles, but not really in terms of the recordings. Joonas’ had small issues, but he didn’t even cause a delay in the schedule. A lot of other stuff was happening around the other band members, loss of family members that brought obstacles in the schedule. At the same time, Napalm wanted to move the release of the album one month earlier – because of the US tour, and wanted the album to come out before the tour, not after the tour. We lost four weeks with the deadline, which is a good thing – as we will get the album out before the first date of the US tour. It was surprisingly stressful – the recording and playing went quite well, considering the schedule was really difficult. Dead Rhetoric: Some would consider it very risky to open the record with a ten-minute plus epic like “Everlasting Fall”. Did you have any fear placing the longest track first – or do you believe it sets the tone for the record because of its depth and dynamics? Saukkonen: Originally when I started to write the song, the idea was to divide the song into two separate tracks. Separate the intro part like on the previous album where we have an intro – the more I started to listen to the song while recording and mixing I saw it as a whole. I made that compromise musically – it made more sense to have things as it turned out. I’m from the 80’s- I have an old school way of thinking that an album is a whole piece of music and you don’t make any revisions based on one song. Now people can buy individual songs from iTunes, and I feel that you should start from the beginning and stop when it ends – enjoy the whole product. I didn’t see the risk, because to me this is how I thought it should be. Dead Rhetoric: Can you tell us about the video shoot for “Breakwater” – the Icelandic scenery provides quite a majestic backdrop against the fiery band performance shots. How do you feel about the video medium in getting across Wolfheart to the masses? Saukkonen: We have enjoyed doing music videos from the very beginning – I think this is quite a big part for Wolfheart, the visual side. This will continue to be a big part for us. It’s something I want to put more input into, which is also getting a little bit more difficult because there is no more tv programs where they will show the videos. It’s harder to stand out on YouTube, there is so much content there all the time. I do think the visual side is an important part of the band. We’ve been to Northern Norway, and of course all over Finland, so I wanted to take things one notch further. Iceland is the only place where you can get that kind of scenery, spending four days in Iceland with our camera guy, just driving around with the car and looking for different cool places that we could actually use. It was the best four days I’ve spent out so far. Dead Rhetoric: Were you hesitant to get into the water for those shots in the video- that scene looks quite intense as well? Saukkonen: Yes, I was. That waterfall was 200 meters from our hotel. It was a funny accident that we found this kind of place. We decided to do that shoot last because the water temperature was like coming from glaciers – so there was a chance that I might get the flu or something so we had three days to think about this scene. It looks easy in the video because it shows me as diving there once and coming up – but I had to do that six times, the camera guy wanted some different angles and make me walk slower, stay in the water a little bit longer. There was quite a strong current as well, because I was jumping towards the waterfall, I don’t want to use the word scary but it was quite tricky. Dead Rhetoric: How did Napalm Records come into the picture – what impressed you most about their roster, staff, and business practices in comparison to some of the previous labels you’ve been a part of? Saukkonen: Since the contract ended with Spinefarm, we asked new labels if they would be interested (in us), and we had quite a few offers. Napalm showed us that they really wanted us to be a part of their label. Not just the negotiations through e-mail, but we had quite a few phone calls not just negotiating but how we feel about a number of different things, music and things in general. They have an impressive roster of bands in Europe, but also one of the main factors is they are very active in the US as well. That’s the biggest and main goal with the new album – to have a label that can release the album both in Europe and the United States. Because licensing is not very good business for the bands – and if you have a licensing in the US they don’t really invest enough in the band. That was the situation with Spinefarm – it was quite nerve-wracking the negotiation because there were many labels upgrading their offers. It took two months to come up with this solution to decide it would be best with Napalm. So far I’ve been really happy, it seems that I’ve made the best call. Dead Rhetoric: You’ll be embarking on your first North American tour soon with Carach Angren and Mors Principium Est. What sort of expectations do you have, and do you feel it’s smarter to build up a catalog and demand first to play such a big territory in comparison to the shorter distances of a European tour? Saukkonen: The biggest issue is actually the visas and stuff like that. This morning, the last of my guys were confirmed for their visas, which is another big load of stress off my shoulders. In Europe, you just fly there, you play the shows, and then you come home. Super easy, super simple- and relatively cheap from Finland. It’s a big investment for the label to get a European band to play in the US for the first time. That is the biggest thing that holds at least Finnish bands from touring within the US. We probably would have done it earlier, but it was too risky. There were some offers for tours, I think it’s a good thing though that we have established a bigger fanbase in Europe with more albums out. The three previous albums have helped us get some sort of fanbase in the US, but it remains to be seen. Touring in the US will always be exciting, but it’s also a big question mark that maybe someday will happen. And now it’s a reality in just a few weeks. I think it’s a really good package. Carach Angren has a really unique thing going on with the horror, black metal style. It always makes things easier to have another Finnish band on board, we will be sharing the backline. I have known the guys for over ten years, it makes things a lot easier. Dead Rhetoric: As you close in on your forties, are there things you wish you could have told your twenty-something year old self or thirty-something year old self to watch out for to make you life go in the direction and path that you desire? Saukkonen: (laughs). There would be tons of things, but luckily I don’t think like that. I also see age as a number, I don’t feel like I’m going to be turning forty at all. When I look back, there are a lot of things that make me feel really old. This new album of Wolfheart is my 17th album I’ve written or released – I’ve released almost 180 songs. It’s started to be quite a big number. I don’t think I’ve messed up that badly in the past that I would want to go back and tell my younger self to not do things. Everything has happened for a reason, it’s been quite a fun ride to be me. Dead Rhetoric: Who impresses you the most when it comes to your sub-genre of melodic death/black metal these days? Do you see distinct differences between say American and European artists when it comes to songwriting and output? Saukkonen: I must admit that nowadays I don’t listen to new music. I don’t know much about the new bands out there. I do recognize the clear differences between Scandinavian metal and central European metal, like German metal, and then the US metal. There is one band that has interested me a lot recently, and they aren’t even melodic death metal. I don’t know why but I never really got into Mastadon, and I’ve known the band for ten years. I didn’t look into them more deeply, but I’ve been listening to a lot of Mastadon albums lately. That’s the only band I’ve been listening to. I enjoy silence more – because of the touring coming up, quietness is what I will enjoy. Dead Rhetoric: Have you come to a sense of closure with the fact that it’s better to put all your creative focus and energy into one act versus spreading yourself too thin with all the bands you had running concurrently pre-Wolfheart? Saukkonen: No. I’ve been writing solo material for the past year now. I don’t know when I will start recording anything, because Wolfheart is a clear priority. There will be some kind of side project at some point when the time is right, but I can’t tell you win. Both Spinefarm and now Napalm allow me to release albums in quite a fast pace. I don’t need to divide my intentions when it comes to my songwriting. I admit it makes more sense to have one band than working on many bands at the same time. That was the younger me, and I wouldn’t go back in the time and tell myself to take it easy. It was fun at that time, and it made all the sense in the world. There was one year in which I released three albums in three different bands, it didn’t make any sense. It felt right and it was fun at that time. Dead Rhetoric: Do you believe that diversity in the longer run helped you establish a wider fanbase, because of all the different styles you were developing? Saukkonen: I do think so. One of the ideas of Wolfheart is to combine all the styles I had with the different bands. There were fans from all those different projects and bands, that came together with Wolfheart. We have the melodic death metal, we have some black metal influences, some doom metal stuff. It was only working in my favor to have those projects from the past. Dead Rhetoric: In an ultimate world, what would you want your musical legacy to be? Saukkonen: I’m not that old that I would be thinking in that frame of reference yet. I may be forty, but let me work another ten years and then we can talk about a legacy. I’m looking way to far ahead to be thinking about what I would actually be leaving behind. Dead Rhetoric: Are you still doing the landscaping and gardening work in your off-time from music? Saukkonen: Less and less. This is the first summer in twenty years that I’m not actually working the whole season. I have two small projects, and I’m finishing the last one so I have a little time to take it easy before the touring starts. Next summer will be as busy. I do enjoy the job still, but I’m running out of time so the music will come first for a while and I’ll do more of that later. Dead Rhetoric: Are there plans already in place for what you’ll be doing in 2019? Saukkonen: There are two tours locked down. A lot of plans are on the table, so it’s going to definitely be the busiest year of Wolfheart so far.